Fridays are special around here. We do a sugar cereal in the morning. We call it “Friday Froot Loop Day.” We also do pizza and movie night. It’s an evening we all look forward to. It’s important to create traditions and rhythms in life. “Friday Fun Day” is part of that for us. Recently, I did a giveaway for “The Odd Life of Timothy Green.” While I was able to give one away, I was also able to receive one to watch with my family and review. I generally like to watch PG movies prior to watching them with my kids, but I read some reviews and was comfortable sharing this movie with my family. I was kind of surprised that my kids, at their ages, stayed focused on the movie the entire time and seemed to enjoy it. 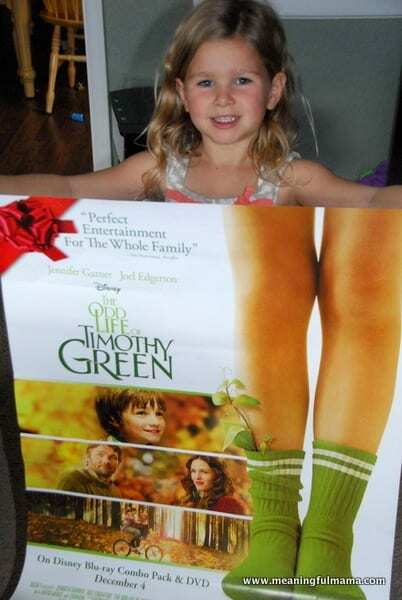 I asked the girls what they enjoyed the most, and Kenzie said, “I liked Timothy,” and Abby said, “I like how he has leaves on his legs.” While that doesn’t tell you much about the movie, I completely agree with Kenzie. I really enjoyed Timothy the best. CJ Adams, who played Timothy, was delightful. He was a captivating character who seemed unfazed by the ups and downs of life. He was quirky but absolutely a character you love to love right away. I thought Jennifer Garner and Joel Edgerton were also cast well in the roles of his mom and dad. This really was a warm hearted movie. It was definitely quirky as the title suggests. I liked the whimsy and artistic elements though. The story line is interesting. Cindy and Jim Green are dealing with infertility. As I have had many friends deal with this challenge in life, I was sympathetic toward their plight. The real emotions were displayed very realistically by the actors. As they had basically given up hope in having their own child, they decided to write down all of their ideas of what their ideal child would be like. The sealed up these traits in a box and buried it in the ground. That night, Timothy appeared from their garden. He was exactly what they had written down. He had one oddity though. He had leaves growing from his legs. He immediately called them mom and dad, and they immediately embraced him. He brought joy to everyone he encountered, and it was not hard to warm to his sweet nature. The movie focuses on him living out every trait and quality his parents had written down while facing the realities of life. The storyline develops and you are invited into this unique world where, eventually, his uniqueness is embraced. This story is full of real life issues – infertility, adoption, hardships, sadness and loss. It is countered with a sense of unconditional love, whimsy, fun, beauty, art and hope. I do recommend this movie. Although my kids did seem to enjoy it, I do believe it would be embraced and better understood by older kids and adults. It is a movie that has a lot of depth and can create a lot of a good dialogue among families, especially with older kids. I love that the content is real but approached in a family friendly way. I appreciate the acting, the beautiful setting, the depth of content and the quirky nature of this film. I was also able to get a great activity sheet for you. Just click the link to be able to download these activities for free.